It's only 2 more weeks to go before I go back to work from my maternity leave. I actually have only started to enjoy the time recently after I got back into "normal" condition and then I realize there is only a short period left for me to do all the stuff that I want to do while on "vacation". So far, I've only managed to fix up my closet and some paper documents. I took advantage of the sale in Shopwise to buy those plastic crates which I filled up with importants documents. I literally threw out a huge box containing old papers (old credit card bills, old work-related papers, old payslips, etc. etc.). I organized my docs in clear folders and piled them in these plastic bins for easy access. I also put into bigger crates my old clothes, maternity clothes and even some clothes in good condition but I choose to not wear anymore for some reason or another. Because of this, my clothes collection was cut into half. With this, my closet has become a more organized space to look at, whereas it was literally a jungle during my entire pregnancy period. I also checked out and dispatched of old shoes. During the process, I realized that a girl can never have enough pair of shoes! Although I've gotten rid of more than 7 pairs of old shoes, I feel that I needed to replenish all of it to have a "secured" shoe collection fit for my job and my role as a mom, wife and friend. Thus, one time, when I went out with my balikbayan aunt, I got myself a new pair of driving shoes (in flesh) and a pair of black slippers that are okay for strolling around the mall. Heaven! Hahaha! Seriously! Next up for cleaning is our attic space. Apart from it having inches of dust, there are loads and loads of bags, stuff toys and other knick knacks (which includes an aerobic stepper, computer stuff, blankets, curtains, toys, and many more) which need to be sorted out and decided whether to keep or give away. And knowing myself, to sort it all out would take me forever to do. Hahaha! Did I say that this week is also exam week for the big sister? I am drowing in Science and Language worksheets now. And then at the end of the week is the big recital for Zoe. She will play Swans on the Lake and Dutch Dance. We need to seriously practice! So good luck to me on my last 2 weeks of maternity leave. Hope I get to finish all my personal stuff before I concentrate again on my corporate responsibilities (and that one deserves a separate post!). I went on a beauty day-off with my girlies from college last week. Ruby got coupons from Ensogo and we got ourselves "beautified" at the Status Salon in Katipunan. I initially wanted to have my hair rebonded but decided the last minute to go for a digiperm. Whhaaa! It was a big change for me :-). Good thing, I'm quite happy the way it turned out. Here are some pictures to share. 1. I can drive again! 2. Trip to Duty Free - new perfume for hubby and new lipstick for me + PX goods galore! Can't stop myself from posting some pictures of my new baby. I am still composing my birthing story and baptismal post of baby so thought of publishing first some lovely pics to capture the memories. 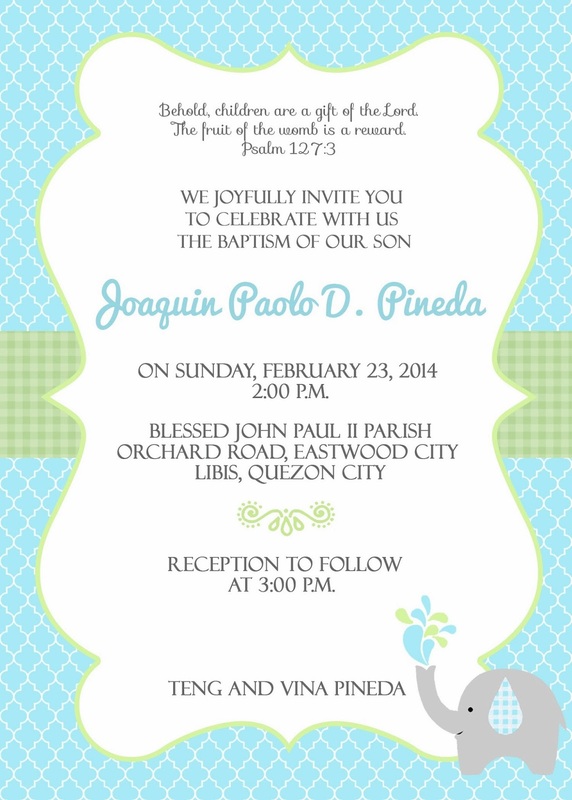 Since I was recuperating from my operation, I had relied on the help of online resources to help me come up with an invitation for the baptism of Baby Joaquin. Thank you to Nyree of Embellished Design Studio for designing this wonderful invite! 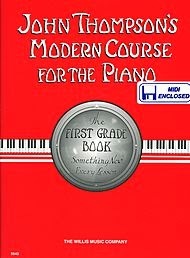 Zoe had finished a total of 10 months of private piano lessons at her school. And now, it's time for her to have a piano recital to show what she has learned from the months of piano lessons. Her recital piece will come from her music book below. Good thing, my Dad brought home with him their electric organ so that Zoe will be able to practice some more and be more that prepared for her recital. Anyway, as early as now, she is already thinking of taking up guitar lessons as well. Well good luck to her! My Ninang, and later on my step mother, suddenly succumbed to a stroke and passed away last January 23, 2014. It was just a few days short of her 69th birthday. The picture above was the last picture I have taken of her. This was on December 25, 2013, Christmas Day, when she and my Dad visited me and Joaquin in the hospital. May the Lord welcome her with open arms into His Heavenly Kingdom. Amen. I am ready. I am ready and well enough to start on an organizational project. That is, a project involving cleaning the house and organizing all the things which have been left unattended during the whole 5 months that I had been put on bed rest and recovery mode. If you think if over, a week of not being able to clean up your closet or cabinet could already end up in disaster. Now what more if it's been left there for months and months! You get the picture. Actually, I've already started cleaning up the pantry a few weeks ago but it got stopped because of lack of time and space. I had gathered all our seldom-used cups, mugs, bottles, even my customized water bottles and had put it in a big paper bag. Now I don't know how and where to store it so that I'll still be able to use it in the future. Any ideas? 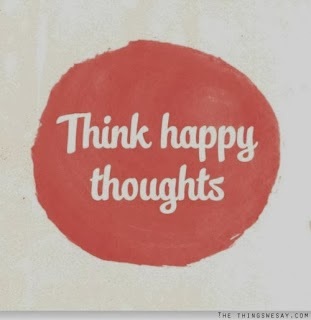 I need inspiration! The clock is ticking since I only have a few more days left from my maternity leave and the baby is still the priority over any house mess! December 31, 2013 - The day we brought Joaquin home. Our family is now complete and just in time for the New Year! Thank you Lord. Gratias tibi Deus!